Ukrainian President Petro Poroshenko and the supreme command staff sing the national anthem during a military parade marking the 23rd anniversary of Ukraine's independence in the center of Kiev on August 24, 2014. Armoured vehicles and soldiers paraded in Kiev on Sunday in a defiant national day display of military power that Ukrainian President Petro Poroskenko said was being mobilised for an historic war of independence from Russia. In a ceremony combining patriotism, solemnity and deep emotion, Poroshenko declared that Ukraine's war against pro-Russian separatists, who it says are armed by Moscow, would likely enter history as 'the 2014 patriotic war'. In a clear reference to Russia's role, he said the country was fighting "a war against external aggression, for Ukraine, for its freedom, for its people, for independence." "It is clear that in the foreseeable future, unfortunately, a constant military threat will hang over Ukraine. And we need to learn not only to live with this, but also to be always prepared to defend the independence of our country." Kyiv,Independence square - August 24 2014. Fighting continued in the east. Early on Sunday, artillery shells rained down on central Donetsk, a remaining stronghold of pro-Russian rebels, hitting the territory of one of the city's biggest hospitals. The separatists accused Kiev of deliberately targeting civilians, something Ukrainian leaders deny. Rebels laid out destroyed Ukrainian military hardware in the city's central square in preparation for their own celebrations meant to counter Kiev's festivities. Ukrainian forces in ilovaysk, Aug 24 2014. Ukraine declared its independence from a collapsing Soviet Union on Aug. 25, 1991, but many Ukrainians believe Moscow has never truly let it function as a sovereign state, and is now trying to restore its control. Russia denies helping the rebellion, or trying to intervene in Ukraine's internal affairs. 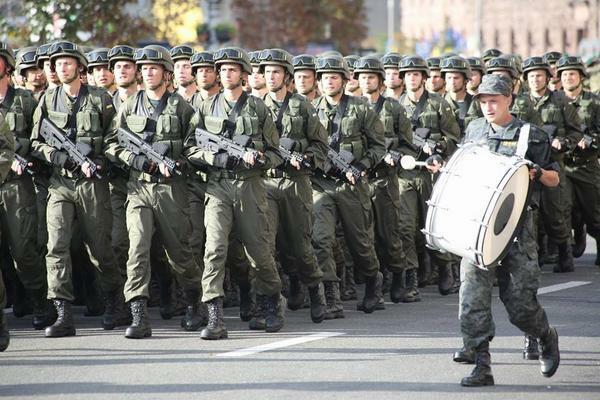 Poroshenko announced 40 billion hryvnia ($3 billion) would be spent on re-equipping the army in 2015-2017. The armed forces are only a fraction of the size of those in Russia. Referring to one detachment of forces who took part in the marchpast, he said: "Before you, a new military column is heading directly to the zone of the 'anti-terrorist' operation." The separatists, and Russia, accuse Kiev of mounting indiscriminate bombing of civilian areas, using irregular militias tied to far-right political groups, and denying residents water and power. Kiev denies targeting civilians. Ukrainian army rearming program in place already. Ukraine made assault rifle "Fort-221". Organisers of the festivities in Kiev said the 1,500 service personnel taking part included about 120 men who had already seen action on the eastern front in areas near the rebel-strongholds of Donetsk and Luhansk. Kiev's Independence Square - known locally as the 'Maidan' and which was the crucible of street protests that toppled a Moscow-backed leader and precipitated the separatist rebellions in the east - was bedecked with the blue-and-yellow flag of Ukraine. Many of the thousands of people who turned out in sunshine for celebrations wore traditional Ukrainian embroidered shirts and blouses or wrapped the national flag around their shoulders. Children, with face-paint decorations of the Ukrainian emblem and waving the national flag, were borne on their fathers' shoulders. Several servicemen, wounded on the frontline, watched the parade from the front of the crowd, some of them in bandages and sitting in wheelchairs. Elsewhere in Ukraine, 20 naval vessels staged a display in the southern port city of Odessa. The navy previously held naval ceremonies in the Crimean port of Sevastopol, but has had to relocate since the peninsula was annexed by Russia in March. There were moments of deep emotion too as the flag was dipped in respect to the 100 or so street protesters who were shot dead by police snipers in February in the last days of ousted president Viktor Yanukovich's rule. Earlier, Poroshenko and his family placed wreaths and knelt down before shrines to those who are now known as 'Heaven's Hundred' and who were killed on an incline just off the Maidan. In recent weeks, government troops have gained the upper hand against the separatists, pushing them back into their main strongholds of Donetsk and Luhansk. Sunday's heady mix of patriotism and military display appeared to underscore a new confidence in the Ukrainian leadership that the war was going their way.